Cooktown is a small town and locality in the Shire of Cook, Queensland, Australia. Cooktown is located about 2,000 kilometres (1,200 mi) north of Brisbane and 328 kilometres (204 mi) north of Cairns, by road. At the time of the 2011 census, Cooktown had a population of 2,339. 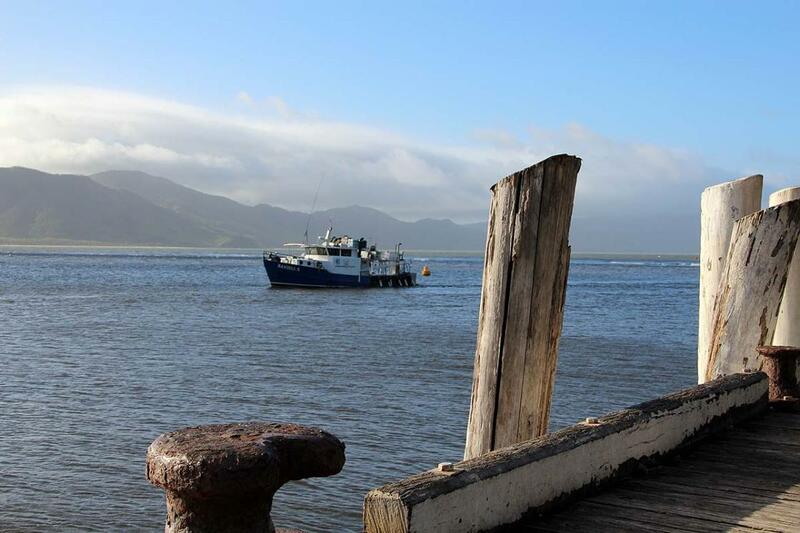 We arrived in Cooktown shortly after Cyclone Ita swept through the town in April 2014. The Visitor Information Centre is located in the Botanic Gardens and not on a main road - a little difficult to find. The Botanic Gardens were closed due to damage caused by the cyclone but the Information Centre was worth a visit. Not far from here is Finch Bay – sand is brown and the signs warn you to keep an eye out for crocodiles - I did not want to go too far. Cooktown is very windy and we were nearly blown off the local lookout at Grassy Hill. Lovely views all around the area but wind and rain reduced the visibility. Cooktown markets are held every Saturday and we went along to have a look - most stalls selling food but one stall comprised a lady cutting hair which was very popular ($20 dollars – cheapest haircut I have had for years). The Lure Shop (across the road from the Markets on Charlotte Street) is full of fishing, camping and all sorts of hunting equipment. This is very large and popular with people heading up to Cape York. Coffee at Capers Cafe (again on Charlotte Street) which was great and extremely busy. They also have a book exchange for travellers – if you do not have a book to exchange then you leave $3 - great selection. Historic Lion Dens Hotel for lunch - situated on the Bloomfield Track 29 km south of Cooktown or 65 kms north of Cape Tribulation. The Hotel has camping and powered sites available and offers meals all day. Signatures all over the walls of this old hotel with loads of old wares on display. Highly recommend a visit the James Cook Museum which is housed in a stunning 19th century convent building. This has a great display on Captain Cook’s stopover at Cooktown for seven weeks to repair damage done to the Endeavour on the Great Barrier Reef. They have recovered one of the Anchors and canons that were jettisoned from the ship in 1770 and these are displayed in the museum. Memorabilia from early mines in the area, the original convent, information on the local aboriginals, as well as the history of early settlers of Cooktown. The gardens contain some of the 170 species identified and named by Sir Joseph Banks. This is a beautiful part of the world but as I said before very windy. have you been to Cooktown? Explore Cooktown with RvTrips and find out where to stay, what to do and what to see. Helping caravan, motorhome and camper owners have a great holiday.